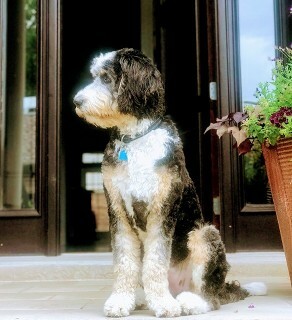 "Sparkles" picture was one of three selected to win the contest on Puppy Find to represent the "Bernedoodle Breed Profile". Congratulations to Sparkles and Jill!!! From: jillbstern@gmail.com In Atlanta, GA Picked up in person. Thanks for your email. When she's not eating our house, she's doing great! 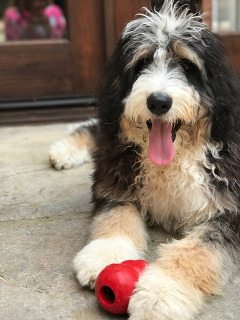 Her name is Four and she has an Instagram account at 'fourbernedoodle'. She's quickly below a very loved member of our household, a protector of the kids, and a playmate for our older dog, Tonka. We just wanted to say how happy we are with the pups we received. 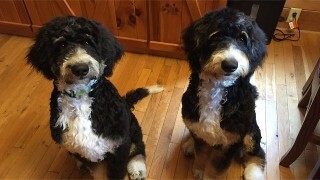 They are almost six months old now are at 50 and 54 pounds. 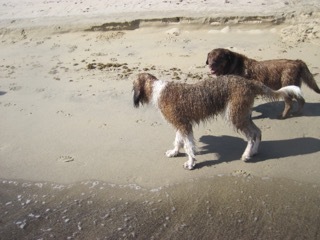 They are both happy, healthy, and energetic, and they can wear me out playing. When we visited we were impress with your facility. We were able to see and pet both parents which meant a lot to us. Thanks for the additions to our family. I'd love to write a testimonial!!! We love our Sami! We should have named her Shadow. She follows me everywhere! She is always trying to please and loves to cuddle. She is very energetic and enjoys going in the lake. Everywhere we go, we get complements about how beautiful she is. She is currently 51 pounds. Jojo is doing great! She's beautiful, fun, loving, and very sweet. 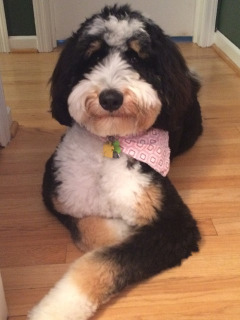 "I highly recommend Penny as a breeder of Bernedoodle pups. From the start she was very responsive and easy to work with - always providing information when requested, and working with us to make sure she was delivered safe and sound to our home in Chicago. 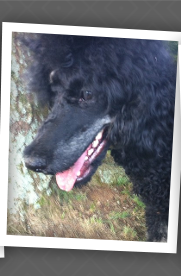 Jojo has a great temperament, so fun and loving, and a beautiful dog. 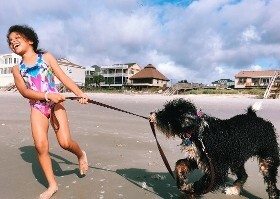 Thank you Penny for bringing this bundle of JOY into our lives!" Lucy is doing good. She is now 7 months and weighed 63 pounds, she has been gaining about 2.5 pounds a week but expect that will taper off the older she gets. 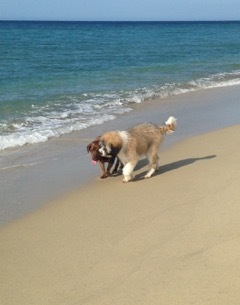 Attached are some pictures, the ones at the beach she was almost 6 months there the others are 7 months. 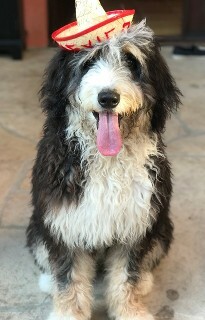 I have never been happier with a dog than this Saint Berdoodle, not once have I regretted getting her. She is so sweet and lovable and such a character. Was very easy dealing with Penny, I liked that she had to talk to you before she would let a dog go as she wanted to make sure we were aware these dogs were going to get big and wanted good homes. I would differently get another dog from her. 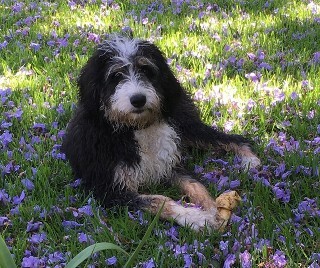 We love our Staint Bernoodle puppy who is now 7 months old and weighs 82 pounds! 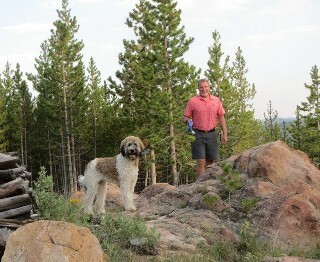 He has been the best addition to our crazy Wyoming family as you can see from these photos. 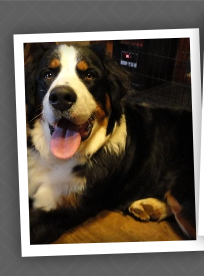 His name is Eiger, after the famous mountain in the Swiss Alps: and he is a gentle giant---everything that Penny Handmacher said he would be. He is loving and loyal and lazy..... meaning he sticks to us like glue and does not need a 5 mile run every day. Penny was fabulous to work with! I feel a deep connection to her even though we are far apart. She was very clear and upfront.... and fun. 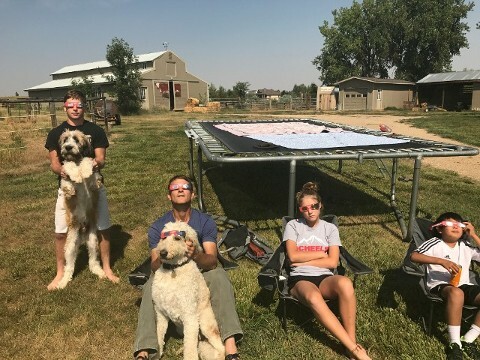 PIC TAKEN ON 8/21/17 ECLIPSE DAY!!! 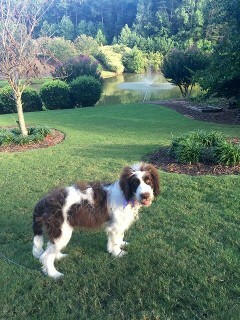 Huckleberry is doing great! He is beautiful and smart and a great family member. He got a clean bill of health from the vet and is enjoying an active Colorado lifestyle! Thank you for such a great family member! Our experience was great, you were more than accommodating on getting Jasper out to us on a date that worked for us. 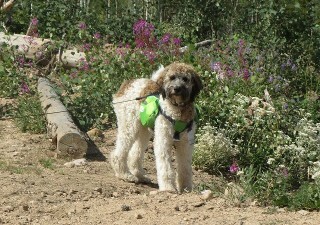 He has a perfect demeanor, he is loving and sweet, good with adults, kids and other dogs. 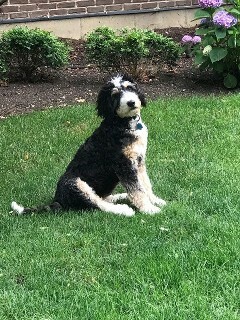 He is about 7 months old now and weighs about 65lbs. 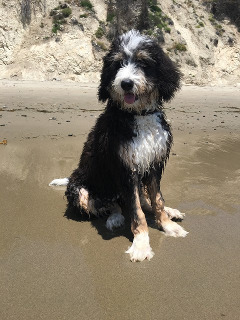 He was such a gentleman and easy to house-train, has learned his obedience commands super quickly and didn't destroy anything during his puppy phase!!!! 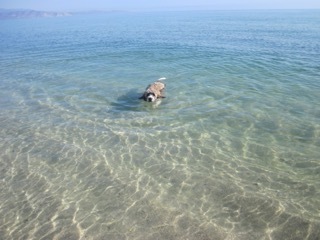 He is a huge water dog and loves going to the beach. He is more than what we hoped for. 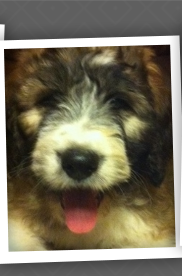 Darlin's Saint Berdoodle Litter DOB 01/25/17 @ 6 months old "Maverick"
I am extremely blessed and grateful for the opportunity to work with Penny and ultimately get my sweet baby Maverick. 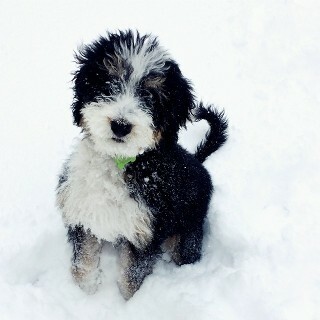 He is truly one of the best puppies I have ever had and continues to light up our world every single day! Penny was so easy to work with and is without a doubt one of the best breeders out there! Maverick was everything I hoped for and even more! Hi Penny here's a brief update on George 1/9/2017: George is continuing his service dog in training. I have been enjoying training George since day one! 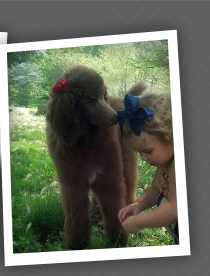 You are an exceptional top knot here breeder Penny! 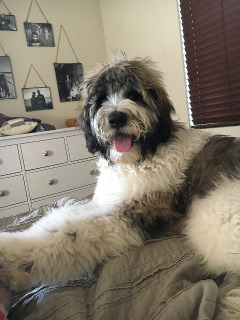 At 7 months George is weighing in at 56 pounds. He health including his blood/hips are perfect! 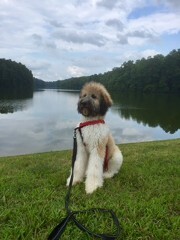 This is a picture at the lake about a week ago..
We love our Saint bernadoodle. She is so sweet, gentle and relaxed. She is really smart and listens to commands well. Lulu was sent to us by plane and that worked well. We are very happy with this breed. 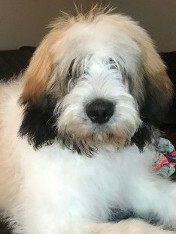 I obtained my St. Berdoodle, Quincy, from Penny in October 2016. 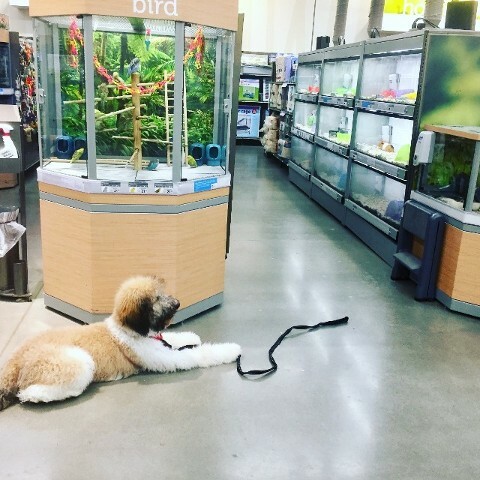 I have to say I was impressed with her commitment to maintaining her process of selection, purchase and shipment; she demonstrates sound business practices as a breeder. 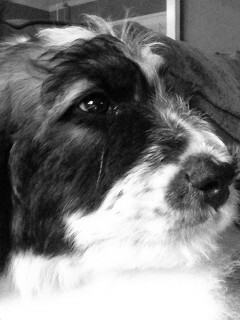 When Quincy arrived he was a ball of fur with the most precious disposition and expressive brown eyes. 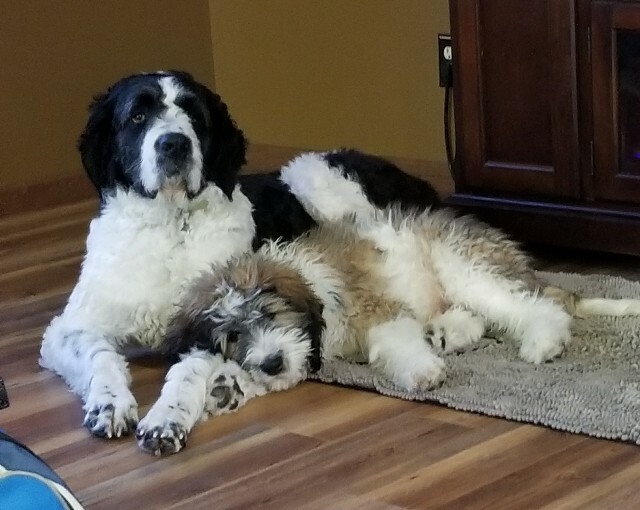 He has 3 older brothers, Hank, Rookie and Moses who were not too sure of his presence but he acclimated well especially with Moses,another St. Berdoodle. 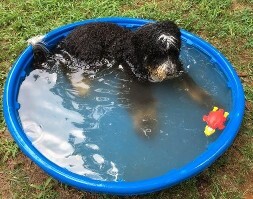 Since his arrival he has brought a spunky attitude with a sizable amount of playfulness which has resulted in his learning to 'catch and fetch' and swim in our inground pool! He recently turned one year and weighed in at 102 lbs! He is a friendly pup and admired by those humans he meets. Strongly recommend consideration of Penny if you are looking for a wonderful healthy pup with a great personality !!! 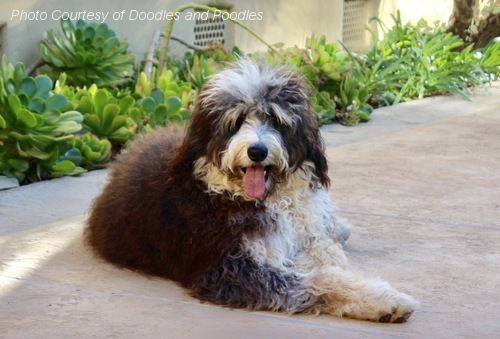 F1 Saint Berdoodle "Ziggy" Adult weight 138 lbs. Here are a few pictures. You should see him run. At the dog park he is remarkable gracefull for a big dog and is the most gentle. He has a remakable trait to run into the middle of a group of dogs getting nasty and just stands in the middle like a cop. He other hobby is to get pets. He will go up to anyone in the park and leans against them for pets. He is so big and cute nobdy can resist. 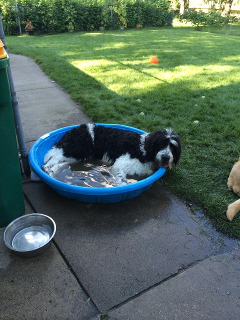 If you want to see more, he goes to Dog Days St Paul a couple of days a week and they have pictures of him on their facebook. Thank you for a wonderful dog. I hope you don't mind if I give your name to others looking for another "Big Zig"
Will and I want to thank you so much for bring Churchill into our lives! He is absolutely wonderful and exactly what we were searching for in a dog. Thank you for making the process to get him so easy. You've been in contact with us since the day you knew that Trinity was pregnant; and we appreciate all of the pictures you sent us when she had her litter. Picking Churchill was easy! He was so darned cute in the pictures, and even cuter in real life! I was anxious about how he'd do on the plane ride here to Colorado, but when he arrived, he was clean, and appeared to be doing very well. As soon as I saw his sweet little face behind the crate door, I was hooked. We let him out in the yard at the airport, and he came right to us. He's been by my side ever since. He's getting so big! I think he's easily 25 pounds now. That means he's gained 9 pounds in three weeks. All of the information you sent on how to care for him was spot on. The vet says he's happy and healthy and perfect. We agree! We have crate trained him, and he's just about potty trained. We took him to my sister's house this weekend where he got to play with 4 other dogs, and he did great. He has obviously been well socialized. 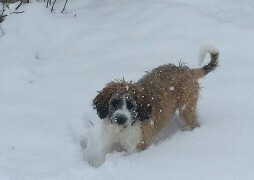 He's going to start puppy training classes as soon as he has one more parvo/distemper shot. And he is going to start going to puppy camp at our local Camp Bow Wow on Mondays to play with other puppies in the neighborhood. In summary, thank you for making the transition to puppy parenthood such an easy one. We will continue to send you updates as he grows and grows and grows! It has been just under a week and I can't begin to tell you how thrilled I am with Brawn (A.K.A. Hoss). The very second I open his crate at the airport I could tell how stable and intelligent he appeared. He calmly stood at the opening of the crate and assessed the situation. He took a couple of deliberate steps from the crate, sniffed the air and walked up to me wagging his tail. He was neither a newly opened bottle of crazy nor did he act like a timid and shy wild animal. he seemed self assured and confident. I took him with me to a family reunion. (All seven of my brothers and sisters attended along with their spouses and children). He met all adults and children with the same intelligence and reserved confidence. After each greeting he wagged his tail. If the person was sitting on the ground he confidently climbed on their lap and settled down. 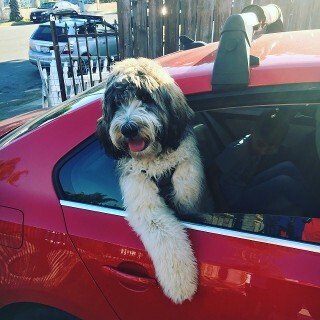 He even met my sister's Standard Golden Doodle the same way. After the 1st day they became best of friends. Again, in play, I saw how confident and healthy he was. During all encounters Brawn was awesome. 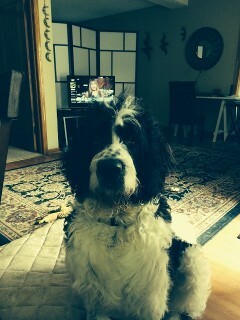 I know he will make a great Therapy Dog for my practice. On a couple of occasions a noise would be heard in the yard. Brawn would stop and look out over his domain. At that instant you could see his beautiful structure and confirmation. I can hardly wait to see how he finishes. 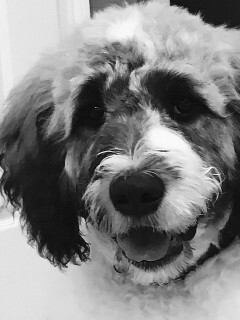 Dear penny, with Charlie's 3rd birthday coming up I wanted to send you some pictures of what a handsome young man he has become. 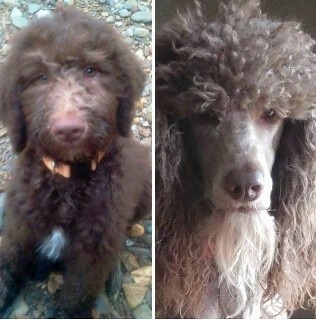 I must say both the standard poodles we got from you are both amazing. They are both so smart and so loving . I can not begin to tell you how happy I am and how much joy they bring to my life. So glad we found you and I'm sure you will be hearing from us in the near future . 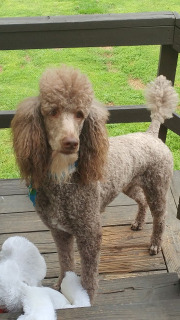 I just wanted to send you a couple of pictures of Boomer, he is doing so well, people comment all the time on what a great dog he is, and oh my goodness is he spoiled rotten. 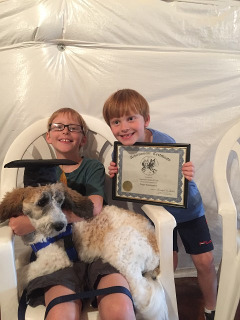 We entered him in the Lewisburg, Derby Days pet show and he WON, first prize in the category “Best Dog – Over 6 months” he won a nice big trophy and a certificate for a free 20lbs bag of Iams dog food. 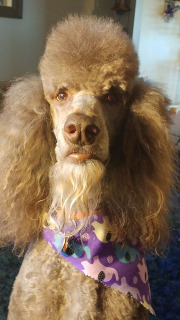 My 12 year old Libby showed him, not that it was much of a show, people just walked their dogs up to the judges and they petted them and that was about it. But we were so happy that he won! We took him camping with us a few weeks ago, and he stayed off leash most of the time, and followed me around the whole campground, off leash, right next to me, walked like he was an obedience trained professional. 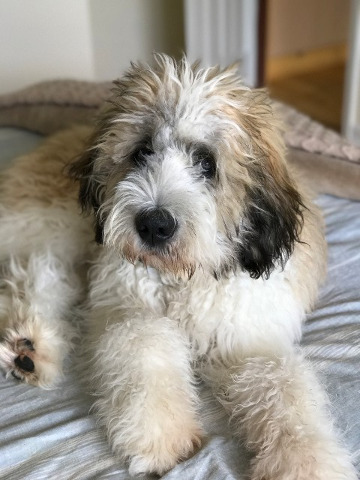 People couldn’t believe that he was an 8 month old pup. As you can see in the pictures, he’s doing great and is a very happy boy. Just thought you’d like an update. I also wanted to see if you are in the process of showing Boomer’s mom, I’d love to come out and see you show her. Please let me know if you would be at any shows in the area that we maybe could come to. From: leisaandjim@yahoo.com Lives in Seymour, TN Picked up in person. Charlie is great! he's a BIG mamas boy. 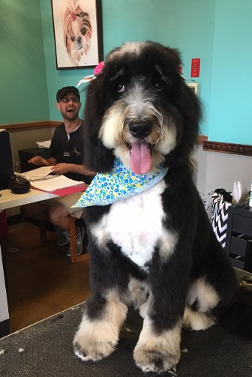 Hates hates hates getting his hair groomed lol Lily is daddy's girl she's the sweetest most loving dog ever . 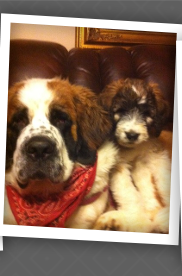 Past Puppy Pics In Their New Furever Homes!! !